DANVILLE, Va. - The Danville Braves struck late in the ninth inning, but its comeback efforts came up short on Tuesday night at Legion Field. Greg Cullen drove in two runs to narrow the D-Braves deficit to 7-5 with just one out, but Henry Quintero and Brett Langhorne were retired in consecutive order to close out the game. Cullen finished the day 3-for-5, garnering his 17th multi-hit game of the year and sixth three-hit game. 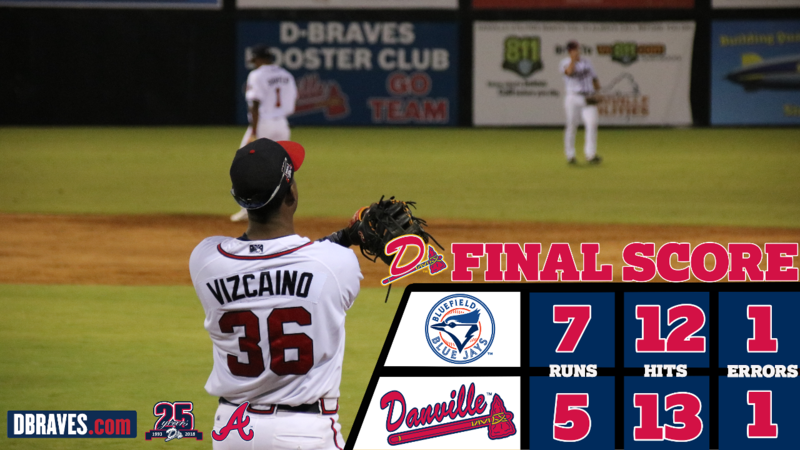 Danville (30-30) lost to the Blue Jays 7-5 and move seven games ahead of the D-Braves for the final playoff spot in the Appalachian League East division with eight games remaining. The Braves also cut the lead to 3-2 in the bottom of the fourth inning. Quintero and Ricardo Rodriguez reached on singles, and Nicholas Vizcaino roped a two-RBI double down the left field line to give the D-Braves their first runs of the game. Vizcaino collected a 2-for-3 day with two doubles, which tallies a career-high in doubles and extra-base hits in a single game in his career. Matt Rowland fought back after allowing three runs in the first inning. In 4.1 innings of work, Rowland gave up three earned runs, six hits and walked five with three punchouts. Bluefield's Alejandro Kirk powered the Blue Jays' offense with in a four-hit day. In five at-bats, the catcher drove in four runs, including driving in the ultimate difference in the game with a two-run double of D-Braves pitcher Luis Mora and to extend Bluefield's lead to 7-3 in the top of the eighth. Trey Riley and Mason McReaken limited damage when thrown into crunch-time situations. Both Danville pitchers were handed bases-loaded situations and managed to strand all of their inherited runners. The D-Braves will continue their three-game set with Bluefield tomorrow at 11 a.m.